Piloncillo - Panela or Panocha Cane Sugar by El Sol de Mexico 16 oz. 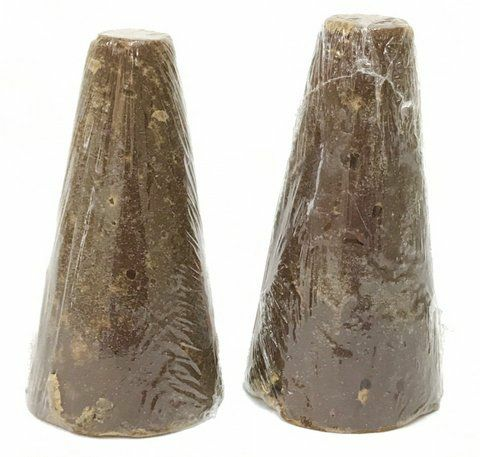 Piloncillo or Panocha by El sol de Mexico (2 / 8 oz Cones) - 16 oz. Hard Brown Sugar Cane Chunks or Cones. Panocha (pieces) de piloncillo (panela or penuche) is a delicious ingredient to prepare Mexican Desserts, such as Capirotada, camotes and cafe de olla. The unrefined brown sugar is known worldwide as panela, but its Mexican version, piloncillo (pee-lon-SEE-yoh), is very tasty. Piloncillo (pee-lon-SEE-yoh) gets its name from its cone shape and comes in light or dark brown. The taste of piloncillo is richer, and its consistency is harder, than the brown sugar. Piloncillo is made from pure sugar cane juice from cane that has been hand cut, crushed mechanically and then heated to reduce its water content. The resulting thick syrup is poured into cone-shaped molds to dry. Purists appreciate its unadulterated aspects: it's molasses-free, chemical-free. You can chop your piloncillo or panocha, grate or get out a molcajete to grind just the amount you need from a cone, which should be kept dry and tightly wrapped. In some South American countries piloncillos is also called panela. Panela is a pure, wholesome, traditional, unrefined, non-centrifugal whole sugar. It contains the natural goodness of minerals and vitamins inherently present in sugarcane juice. Panela is known by many names such as- turbinado sugar, Jaggery, Gur, Raspadura, Piloncillo, Panocha or Penuche. Trozos duros de Azucar morena de Cana. Panochas de piloncillo. El Piloncillo viene a ser la az�car oscura sin refinar que se vende en forma de cono truncado como subproducto del proceso de refinado. Se sustituye con az�car morena. Dore las rebanadas de pan en aceite y quite el exceso de grasa poni�ndolas sobre una servilleta de papel. En una cazuela coloque una capa de rebanadas de pan, c�bralas con pasas, cacahuates y trozos de queso, luego ponga otra capa de pan, pasas, cacahuates, etc. y as� sucesivamente. Ba�e con la miel. Ponga la cazuela a ba�o Mar�a una 1/2 hora para que se suavice el pan; espolvoree con grageas de colores. Many recipes come out much better with this form of sugar. We needed this for some recipes and were able to buy it from Mexgrocer. ProsJust what we needed, and priced right. ConsPackage image and product as delivered was different. Image showed small pieces, actual package contained 2 large 4 oz. pieces. This is my favorite product. I used already, I make melcochas, Thank you very much.